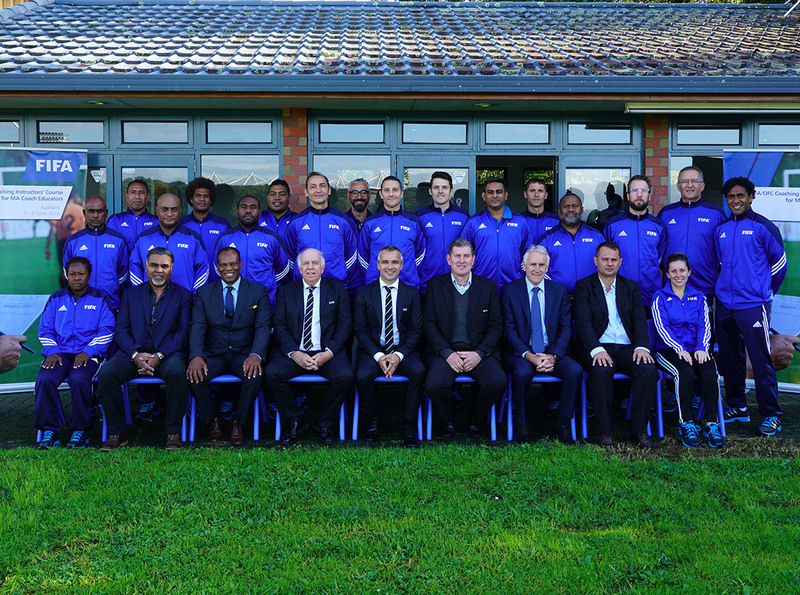 Coaching educators representing nine member associations across the Pacific are embracing a unique opportunity to enhance their knowledge with the start of a five-day FIFA/OFC Instructors Course at the OFC Academy in Auckland. With some of the most esteemed FIFA coaching instructors in New Zealand to deliver the programme the 18 participants face an intensive but enjoyable experience. OFC Head of Education Giovani Fernandes says the main purpose of the course is to empower the coaching educators to deliver their own programmes within their own context by adapting it to their own realities inside their MA’s. “Our approach is to have active participation of the candidates in the course and a lot of reality based experience so they will actually have to do the things that they do in their member associations and in that way along with the FIFA experts we can share and support each other to improve,” he said. Following a Maori welcome ceremony, a powhiri to officially open the course, work had begun in earnest for the participants who will be learning from some of the biggest experts in the game according to Fernandes. “We are really lucky with Branimir Ujevic, FIFA’s Head of Coaching and Player Development joining us, we also have John Peacock from UEFA who has immense knowledge and we are quite fortunate to have him here. “We have Jean-Marie Conz also from FIFA, who has been involved in the game for huge period of time and then we have Etienne Siliee From CONCACAF who brings quite a unique element to it, there are a lot of similarities with OFC and we can cooperate a great deal by learning from each other and last but not least Mohammed Basir from AFC, who again has been involved in coach education for a long period of time and can complement the work that we are doing,” Fernandes explains. Branimir Ujevic believes the course is an important step forward for coaching educators in OFC member associations. Both Ujevic and Fernandes are keen stress that it’s a long term process with participants first introduced to the formal learning programme throughout this week before they return to their MA’s to deliver the activities. Monitoring is one of the key elements of success says the FIFA Head of Coaching and Player Development. “I would say the biggest change in our approach is not regarding only the course but it’s about the follow up as well. “That means we are going to create one database of coaching instructors inside OFC and we are going to be permanently in touch with them,” Ujevic explains. One of the participants Margaret Aka is the first woman outside of New Zealand to be accredited with an OFC coaching license. She believes the course will provide her with the necessary tools to inspire and help other coaches after her return to Papua New Guinea. “I’d like to go back and be the person that can help other people see coaching as part of the learning process and to help players build for the future. “This course is an important stepping stone to achieve that and I’m looking forward to it and hope that when I get back home I can inspire a lot of people to coach and help kids and players,” Aka says. Despite the intensity of the programme, Fernandes believes the participants will enjoy the experience. Following the opening day Ujevic has also expressed plenty of positivity regarding the course as well as the future of coaching development across Oceania. “Based on the opening ceremony and the first topics that we have ran I have high expectations regarding the improvement of the group that is attending the course. “And in the future we are going to be in close touch with them and we are going to be at their disposal to help their development in their respective MA’s,” the FIFA Head of Coaching and Player Development said.